Each vanity is hand-crafted and hand-painted; hence each piece is unique and varies in color. Natural stone surfaces and hand built furniture characteristics will not be considered a manufacturer’s defect. Product(s) being return will only be accepted in its original non-damage state. All return MUST include the original manufacturer’s box and packing materials, no exceptions. PLEASE SEE OUR RETURN POLICY FOR FURTHER DETAILS. All exchange or refund request must be filed within 30 days of receiving item. Luxury Living Direct reserves the rights to replace, repair or refund due to damage item. Refunds will only be given if we cannot exchange the item due to out of stock. Receiving instructions will be given once an order has been confirmed process. To ensure that you receive a refund or an exchange of your product(s), it is absolutely required that you follow the receiving instruction. At the time of delivery, please request an inspection of the product. If the driver allows you inspection, please notate ANY damages found on the delivery receipt. If the driver would not allow you to perform inspection; you MUST take picture(s) of the package BEFORE you open it and notate the condition the package is in such as; “CREASED MARK”, “CRUSHED CORNER”, “TEARS”, ETC, on the delivery receipt. Customers who sign the delivery receipt without making the proper notations agree to receive the shipment in good condition and any damage found thereafter, is the customer’s sole responsibility. This warranty extends only to the original owner or end-user for personal household use. This warranty is void if the product has been moved from its initial place of installation. For commercial uses, additional limitations apply. Luxury Living Direct warrants the product to be free from defects in workmanship and materials under normal use and service for a period of one (1) year from the initial date of purchase by the owner or end-user, contractor, or builder. This warranty shall not apply to instances of incorrect operating procedures, breakages, or damages caused by fault through improper installation, carelessness, abuse, misuse, misapplication, improper maintenance, or alteration of the Product, as well as chemical or natural corrosion, accident, fire, flood, an act of God, or any other casualty. Avoid abrasive cleaners, steel wools, and harsh chemicals as these will scratch, damage, and / or dull the product and / or finish and void this warranty. The owner/end-user of the Product covered by the present warranty is entirely responsible for its proper installation and any applicable plumbing. Luxury Living Direct neither installs nor supervises the installation nor hires a contractor for this purpose; consequently, Luxury Living Direct cannot be held responsible for any default, breakage, or damages caused thereby or resulting thereof, either directly or indirectly. The owner/end-user must provide access to the components of the Product as described in the installation guide so that Luxury Living Direct can execute the warranty specified herein. If such access is not available, all expenses to provide said access will be the responsibility of the owner/end-user. This warranty does not apply to local building code compliance. The owner/end-user should check with the local related plumbing codes before installation. This warranty does not apply to Products that have not been installed or operated in accordance with instructions supplied by Luxury Living Direct and all applicable rules, regulations, and legislation pertaining to such installations. This warranty does not apply unless the Luxury Living Direct Product is installed by fully insured licensed professionals. 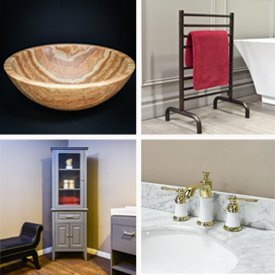 Luxury Living Direct strongly recommends that such licensed professionals have experience in the installation of bathroom products. Installation of certain products, including, without limitation, glass products (i.e., glass countertops glass sinks) by an inexperienced person may result in glass breakage and, consequently, cause personal injury or death. PLEASE SEE OUR WARRANTY FOR FURTHER DETAILS. Product(s) ships within 3 – 4 business day AFTER placing order. All shipment will ONLY be curbside delivery. Luxury Living Direct is not responsible for any additional fee such as, storage fee, redelivery fee, reconsignment fee (change of address during transit) and inside delivery. We will ship only to the lower Continental 48 United States. Luxury Living Direct is not liable for any labor or material charges, loss of time, loss of profits or any incidental expenses.